Best part - no coding required and they are free. At Indiez, we have spoken to more than 600 non-tech founders and worked with 100s of them very closely. We know for a fact that 90% of startups fail because of bad marketing. Even the best products failed because they cannot reach their users. No users, no growth and no growth is failure. First things first, the most important things for an entrepreneur is to hustle. Do hard work and do it persistently. Believe in what you do. It’s a tough ride with a hell lot of learnings and un-learnings everyday. The most important thing you have to know how to tell a brilliant story that connects with your potential users. The Indiez community has already built amazing products for over 200 companies around the world and as a result we see startups that fail to grow and we hate it! So as a favour, we helped 10+ startups with their growth marketing. It was amazing to see how some hacks resulted to 1000s of users in a single day and some couldn’t even get 1. We decided to share some of our hard earned learnings that we’re sure will benefit you. You DO NOT have to be a techie to execute any of this techniques. You just have to hustle and work hard like a true entrepreneur. You already have a FREE option to build your customer base initially— people that you know or have contacted before. Before you launch, create a group message on Whatsapp, iMessage or whatever messaging service you use and simply inform them on the project that you are building, ask for help, advice and if they can give you feedback on your product. Connections on Linkedin? Friends on Facebook? Everyone has them! You can download their email addresses via different techniques. Export your Linkedin contacts via this helpful page. Export your Facebook contacts via this helpful page. If you struggle with anything like this — We are willing to help, just get in touch here. Here’s one example of the mail that I received from a friend who was building his new startup. Online Community — Start Your Own Internet Kibbutz! Identify your target users and reach out to them BEFORE your product launch! 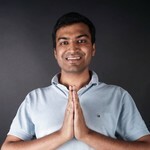 Basecamp, the cloud-based SaaS startup serves as an excellent example. Before they launched Basecamp, they had up to 50,000 followers via their blog, “Signal vs. Noise.” This built-in community helped make Basecamp’s launch successful. Ryan Hoover, founder of product hunt, had a huge emaillist before he started Product Hunt. Networking events are becoming key to ‘getting your name out there’, you can even meet fellow professionals who will help you and introduce you to invaluable contacts. This used to be an expensive form of community building but we are seeing websites such as MeetUp and EventBrite sometimes offer a platform for FREE networking and learning opportunities. These events will also provide you with emails, business cards and opportunities to follow up the leads you have created from attending. 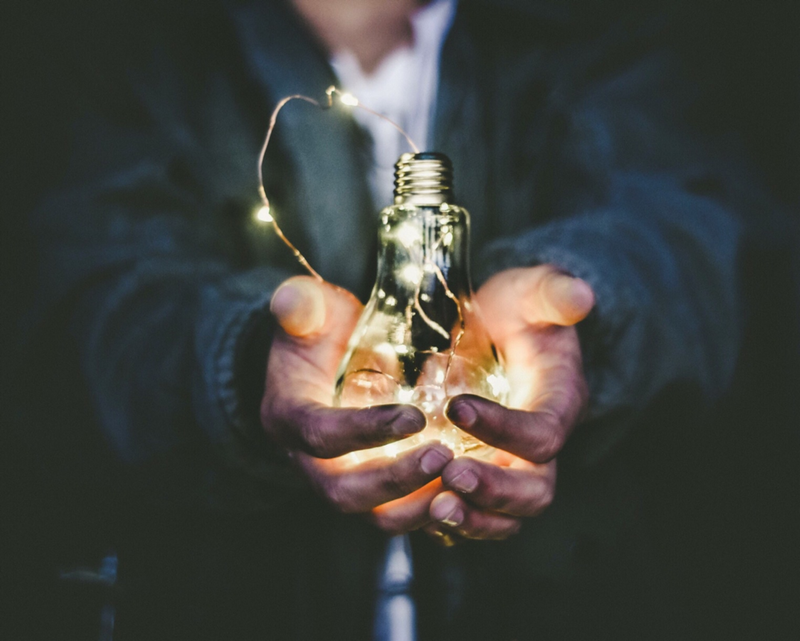 Events are strife in the startup world but this should not put you off, you could even do something quirky and original to ensure you are remembered! Creating unique business cards could really do the trick, even LEGO produce special individual figures for their staff to hand out at events to allow them the best shot at being remembered. Twitter, Instagram, Facebook — We all have them personally and so do businesses! They are a powerful tool for companies to develop a community and by using the relevant # it will send you on your way of gaining traction. Check daily what is Trending and see if you could provide attention to your tweets from these Hashtags. It starts from today, social media will be the core to the future of your business. There are countless opportunities of where to take your business and how you will interact online. You could even try and be cheeky and get noticed via witty comments but always be careful as social media is the ‘voice’ of your brand. We will join the community but where do we go?! You need to create a landing page and this is a lot easier than you may think, tools such as Instapage, Wix and Squarespace are available to give you a platform to create a user-friendly relevant page. You are in control and can make as many changes as you wish, many companies regularly change all their website and content in the first year of launching their business. Now that you have the database of relevant and irrelevant business contacts, you can use tools such as MailChimp to send interesting, helpful emails to contacts you have downloaded from Linkedin, Gmail, Icloud etc. If you send a similar message to the one that you have texted your family and friends, you should receive help back. At this stage, do not try and sell to the community — ask for help, feedback and advice. You can also build your own community from other relevant communities. If you join them, you can see what similar businesses are doing. As a plus, you’ll have enthralling discussions, share excellent insights and get renown for your great knowledge within the field. If you do it right in other communities, you will gain a solid reputation and people will naturally want to learn more about you. I love how Josh Fetcher built a solid community. Google your competitors, search their social media and learn what they are doing and then go on and do it better! Community Spirit: EACH AND EVERY USER IS IMPORTANT. Try and arrange a phone call with them! Offer them an ‘onboarding’ experience they will never forget! 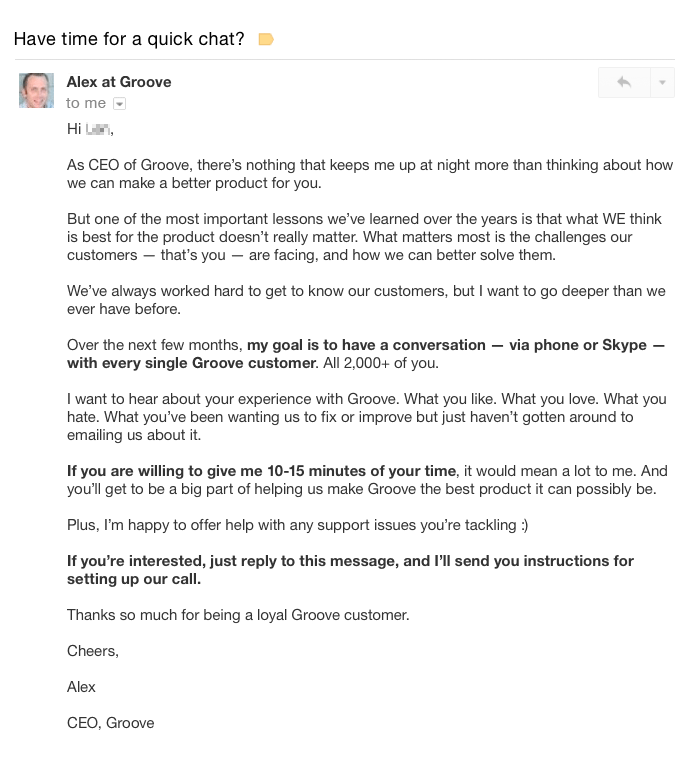 Look at the email sent by Alex, founder of Groove. This provides you with an amazing opportunity to have a full understanding of each and every member of the community. They will feel special knowing that they are part of a ‘select few’ and your competitors will have a much harder time finding out about your ingenious product. Now for the most difficult part of your journey….increasing your community from 100–1000 after launching your product. Keep iterating on social media and use these free organic channels as they are a very powerful tool. Referrals are the cheapest and easiest way to continue the growth. If you provide your community with a template, they can easily send this to their friends and family and they will then send to their friends and family and it will go on and on and on! Bourn Creative, a US company providing WordPress themes, built their community and customer base 100% via referrals. Referrals are free and very important, your product is worth it and this is why you founded your company, other people will share the same vision. You can use products like Viral-loops and Launch Rock to build a unique referral marketing campaign. Practise what we preach! We create content, like this article because we believe that our readers, like yourself, will benefit from our stories. Content creation needs creativity and this will come naturally to you, you have already created your product and the passion will convey through any story you tell via a blog post. It has to be genuine, honest and from the heart, this is the exact reason we have created this content for you because we truly want to help your growth in the simplest way possible! Your original community will gladly share this article for you, ask them to ‘retweet’, ‘clap’, ‘share’ and ‘like’ on their various social media platforms and organically your community will grow. It cannot be emphasised enough how important it is that more content does not equal better content. Content needs to be backed up by solid product research, validation of your audience, competition knowledge, efficient workflows and core strategy statements. UXPlanet recently posted an interesting blog about how to get the best from your content strategy and how to implement it perfectly. Once you are creating your blog posts, upload them onto Medium with the relevant tags. Many users will search for different articles to read and if you have already got your community to ‘clap’ your article on medium, it is going to gain the attention from the right audience. Another interesting platform is Quora, the place where people globally ask absolutely everything and anything! Search and Identity relevant questions and provide these answers. You could use a question in your field and provide yourself an opportunity for the right people to go and see your product. Now your community is ever expanding and you are providing interesting pieces of content, use your social media channels and do some small budget ad campaigns. Facebook even provide new businesses with free credit to do this! Having access to your analytics will guarantee that you are reaching out to the right type of person. A social media tool which is really undervalued is Reddit, it has millions of daily users who regularly discuss topics that are right for them. If you are active and frequently posting onto it, you will generate discussions from reddit users who will refer and tell their friends. The discussions will continue to grow, the more active you are. There is even an opportunity to create reddit discussions in different languages and ensure you have a true global reach! Influencers are available on all Social Media platforms, not just YouTube. Reach out, find them, email them, introduce yourself and your product and they may even promote it for free. Just one retweet from an influencer could gain thousands of new followers for your business. Social Media tactics are deployed by all types of business, target internet has given examples of established businesses who are managing their social media to the highest of quality. Get ahead of the game with tools such as intercom, especially once you have launched your product. It allows you to interact directly with your customers either on your website, social media and more. Using it will provide an excellent experience for anyone wanting to have their questions answered and it also provides that ‘personal touch’. New Relic used intercom because they wanted useful feedback about a new feature. Rather than spam their entire database with a survey, they decided to use Intercom to target power users of the feature and sent it to their inboxes where it wouldn’t be as disruptive. It resulted in 21% providing feedback, which was a 2.5% increase on usual tactics they deployed. Your product and community is now growing at a consistent and valuable rate. You are a non-tech founder and we hope you now realise that ‘Growth Hack’ is not a scary word, it is purely a way of growing your business right from the start. This article is advice on what we believe should be done but in reality, growth hacking is trying and testing. If you are doing everything you can to try and grow, then you are never to blame if you are failing to gain users or traction. The issues could be in the market or the product itself, this is why the feedback stage is imperative to success. Have a read of this Paul Graham article — make something users wantand understand what people are looking for. You can read about some basics of growth via Andrew Chen’s blog, Brian’s blog and Josh Fetcher’s ebooks.